Scientists at Goddard’s Laser Remote Sensing Laboratory designed and developed the Laser Vegetation Imaging Sensor (LVIS) a laser altimeter that can map large areas of sea ice and glacier zones from a high altitude. LVIS combines ice elevation learned from laser pulse timing with aircraft position from onboard GPS and inertial navigation systems to produce accurate ice elevation data. LVIS has flown together with the other IceBridge instruments aboard the DC-8 and P-3B airborne laboratories until 2011, when it was assigned to a dedicated aircraft. Since that time, LVIS has flown in a King Air B-200, a Gulfstream G-V and an HU-25C Guardian Falcon. 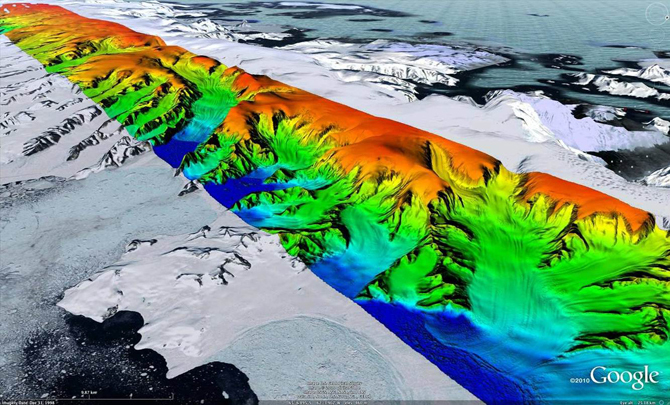 LVIS is used to survey previously unmeasured areas of ice and as a way to validate and calibrate measurements by ICESat and CryoSat-2. Its ability to survey larger areas greatly improves IceBridge’s capability to survey ice. 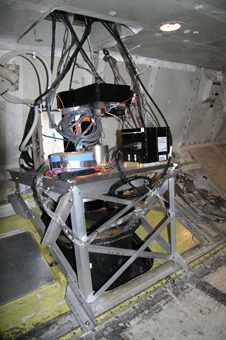 A smaller version of the LVIS instrument, known as LVIS-GH, is under development for use in NASA’s Global Hawk unpiloted aircraft system.